Signature were delighted to attend the launch of the Hearing Screening for Life Campaign in Parliament this week. The event took place in the Strangers Dining Room at the heart of Westminster and was attended by a number of leading organisations from the charitable sector. 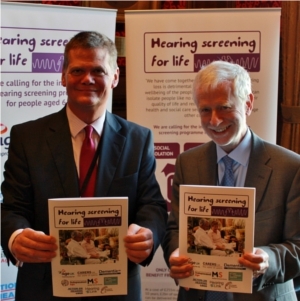 It was hosted by Stephen Lloyd MP who led calls for Hearing Screening to be introduced for everybody at the age of 65. Hearing loss is a major public health issue affecting over 10 million people in the UK. It impacts on people's everyday communication experiences, causing difficulties interacting with their family and friends. Hearing loss also reduces people's ability to access essential services including healthcare, which can aggravate existing medical conditions and lead to other problems. In light of these difficulties it is particularly striking that there are an estimated four million people in the UK with unaddressed hearing loss. This is in part because it takes people an average of 10 years to seek help after they start noticing hearing loss symptoms. By the time many people seek treatment, aged around 75, their ability to adapt and benefit from a hearing aid is greatly reduced. Given that the number of older people in our society is growing, and the issue of unaddressed hearing loss will become increasingly prominent unless action is taken now. Commenting on the Hearing Screening for Life campaign Signature's Chief Executive Jim Edwards, said "One of the main issues with hearing loss is the sense of isolation and estrangement that is left behind. When people lose their hearing they all too often lose access to their social network of family and friends as well as essential everyday services." He added, "This campaign presents a call to action for politicians across the UK. Hearing screening has an important role to play in ensuring that older people are not confined to the fringes of society because of their hearing difficulties. There is a clear case for introducing hearing screening for people over 65 and I am confident that the campaign will be a spring board for future change."